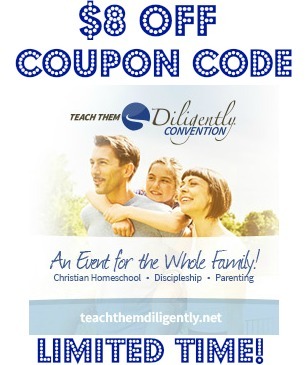 Teach Them Diligently Convention Coupon Code - Limited Time! You are here: Home / Coupons and Deals / Homeschool Curriculum Deals / Teach Them Diligently Convention Coupon Code – Limited Time! Teach Them Diligently Convention Coupon Code – Limited Time! This post contains my referral link which helps support the work of this site. The Teach Them Diligently Convention is a sponsor of FHD. Here’s my full disclosure policy. I’m so excited about the 2015 Teach Them Diligently Conventions! I will be speaking at all four locations including Nashville, Atlanta, Ohio, and Dallas. I would love to SEE you there! Now through midnight March 3rd only you can use exclusive coupon code LASTCHANCE2015 to take $8 off your family registration to an event location of your choice. Hurry, because convention registration prices increase on March 3rd! Click here to register and save on the 2015 Teach Them Diligently Convention!